A stunner, this one. 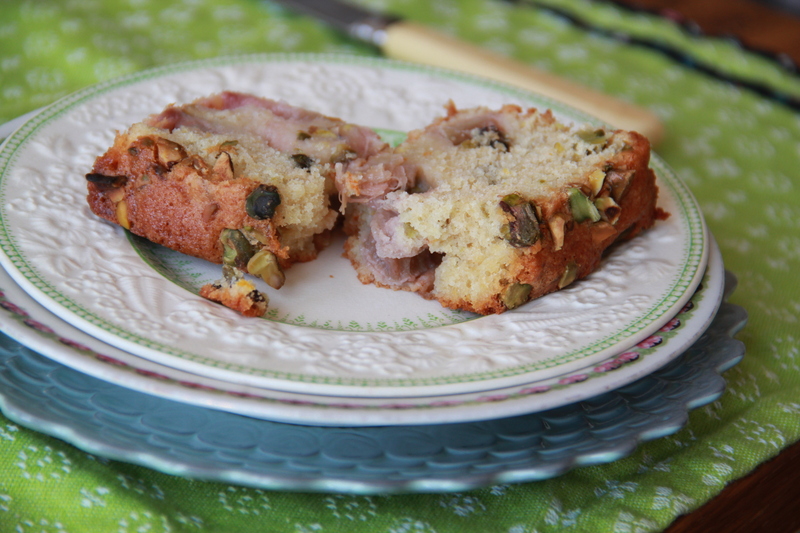 A lightened pound cake flecked with pink and green. Looks nice, doesn’t it? Pretty. Simple. Baked with love. …This cake exploded in my oven. I won’t blame the cake, though it was clearly not my fault. I didn’t tell the cake to explode inside my very own oven, certainly. I didn’t tell it to ooze and bubble, splattering and crusting all over the floor of the thing. I didn’t. Did I overfill the pan? Absolutely not. I don’t know. So what?! So what if I did, huh? Maybe I got a little greedy with it! Maybe I filled the little loaf pan to bursting – so? WHO’S GOING TO BELIEVE YOU, ANYWAY? You’re right. It was me. It’s my fault the pretty cake exploded. But the batter was just so lovely, you see. So bright and rich! 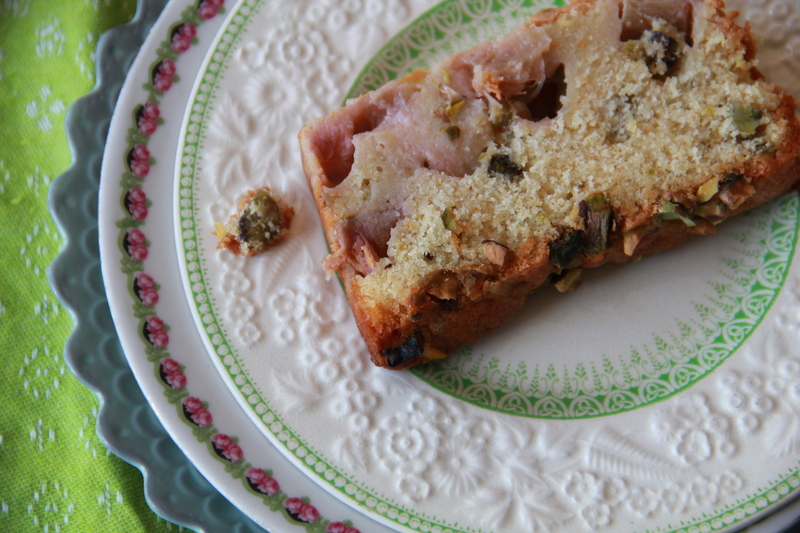 So full of crisp rhubarb, bits of orange zest, gnarled pistachios! I got a little overzealous. I lost my head. I lost my cake. Lesson learned. After a bit of tweaking and a second try, I ended up with the same lovely batter just, fortuitously for those of us who don’t like wasted dough, not quite so much of it. Into the loaf pan it went, and, thankfully, into the loaf pan it stayed. 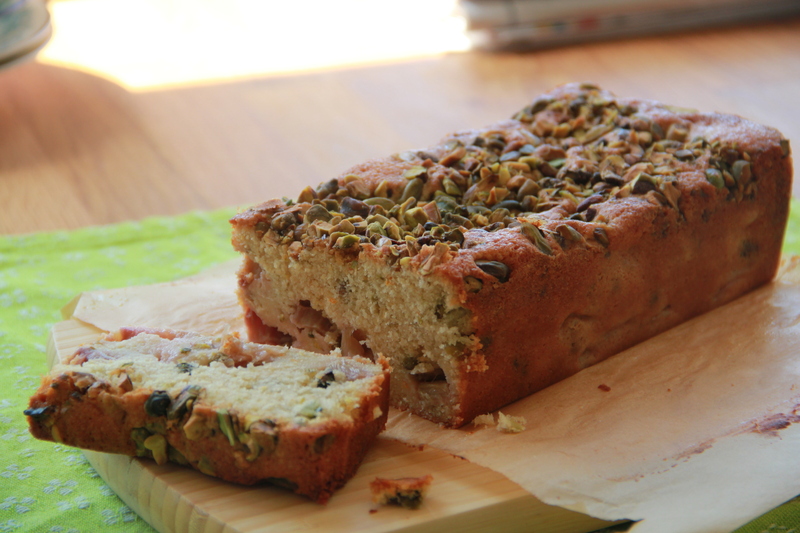 This time it rose gently, weighed down by an ample smattering of meaty pistachios, and baked and browned to perfection. So you see? I’m not a cake ruiner after all. I’m no detonator of gateaux. I, my friends, am a cake tamer. A pound cake whisperer. A genius of the first order of geniuses. Or, you know, a regular baker. At any rate, this cake is tender-crumbed and full of bright flavor. It’s guaranteed not to explode in your oven. Probably. This is, as the title would suggest, not quite a pound cake. It was inspired by a pound cake, to be sure, but, mere weeks ahead of summer, who needs a cake with a pound each of butter and sugar crammed inside? I don’t, so I lightened the recipe by cutting quite a bit of the butter and sugar, adding some Greek yogurt, and using whole wheat pastry flour instead of the regular. If you decide to go ahead with all-purpose, that would be alright by me. I mean, this cake isn’t going to win any kinds of health awards, either way you slice it. But when you do slice it — oh. You’ll be glad you did. Preheat your oven to 325 degrees F. Grease a standard-sized loaf pan, and press a piece of parchment paper into the bottom of the pan, leaving an inch of overhang along the loaf pan’s long sides. Grease the parchment, too. In a small bowl, whisk together the flour, salt, baking powder, and coriander. In a large bowl or stand mixer, beat the butter until completely soft. Add the sugar and continue to beat until light and fluffy. Add the zests and beat to combine. Add the eggs, one at a time, making sure each is well incorporated before adding the next. Add the yogurt and stir gently to combine. Next, add the vanilla extract and fruit juices, mixing to incorporate – don’t worry if the batter looks curdled. Add the dry ingredients and mix on low speed until fully combined. Gently fold in half of the pistachios and all of the rhubarb. Pour the batter into the pan and sprinkle the remaining pistachios atop. Bake the cake until a tester inserted into the center comes out clean, about an hour. Allow to cool in the pan on a wire rack, and then gently lift the cake out of the pan, grasping the parchment overhang and running a paring knife down the short sides of the pan to loosen the cake, if necessary. The cake will keep, well-wrapped at room temperature, for at least a week. OKAY! You win. This is the one. I will make this. You’re so funny, Molly! This cake looks great. ‘Round springtime, I like for all my food to be pink and green. Thank you for this! Most delicious treat, just served it to colleagues celebrating my birthday, all were ecstatic about it! Excellent cake! Thank you for the recipe!